In Pirate Attack! by What the Fun Games, players try to amass large pirate fleets to control the ocean and reap all of the loot and treasure available. I hadn't seen a card based pirate game before, so I couldn't wait to try this game out and I'm glad that I did as it's not only a lot of fun, but every game is different due to the variety of options available, especially when you add in the six expansion packs which add quite a bit to the base game. 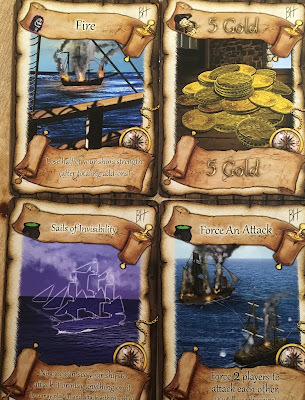 The base game is called Pirate Attack - The Beginning and it includes 350 cards that include the various ships that you can use, gold that you can receive, attack cards, affliction cards to play on other players, and more. There's also tokens, two six sided die, and two D20 dice too. The game has everything that you need to play it which is nice as a lot of games require that you supply your own dice which is pretty lame. Game play begins with each player getting five cards which allows them to start building up their fleet one turn at a time. As you deploy each ship can also fortify it by adding a blacksmith and carpenters to them which will add cannons and strength to your ship. Other players will try to sink your ships by buying Witch Doctor cards to play on you which could cause a variety of bad things to happen to you including poisoning you, causing a mutiny of your men, a fire on board, a storm, or even afflicting you with The Black Plague. The only defense against these attacks is to buy Fortune Teller cards which can counter these attacks if you have the corresponding card that can cancel it out. The options really expand a lot if you add in the six expansions which adds a lot fun to the game. When we first played this game we played without the expansions to get a feel for the base game and it was pretty cut and dried. We got ships, attacked each other, sent spies and thieving monkeys against each other, and it was a pretty basic experience. When we added the six expansions, the fun level went up quite a bit as the sheer variety offered between them transformed the game into a new experience. Once you've sunk an enemy ship, you will get gold (which can be spent at the market) and fame points which can help you win the game. The market can be open or closed by players (which can change the cost of the cards) which adds another element of strategy to the game. We all liked summoning sea creatures to destroy our enemies and there's some real nasty cards in the expansions like the whirlpool which can destroy an entire fleet. 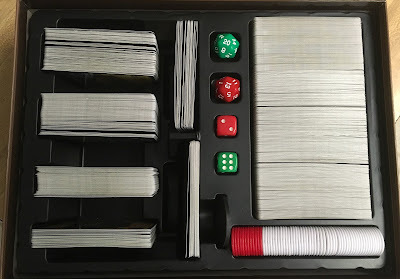 Although there is a nice and expansive rule book included, there were quite a few times that the rules seemed vague and I had to email the game creator a couple of times to get some clarification which he always helpfully provided. I hope that when this game is officially produced, he will spell out some of the areas that need it. 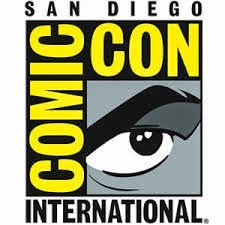 I also suggested to him that it would be really helpful if more of the effects could be added right on the cards themselves so players don't have to keep going to the rulebook constantly to look it up, especially when you include the expansion packs which add even more variations to the game. 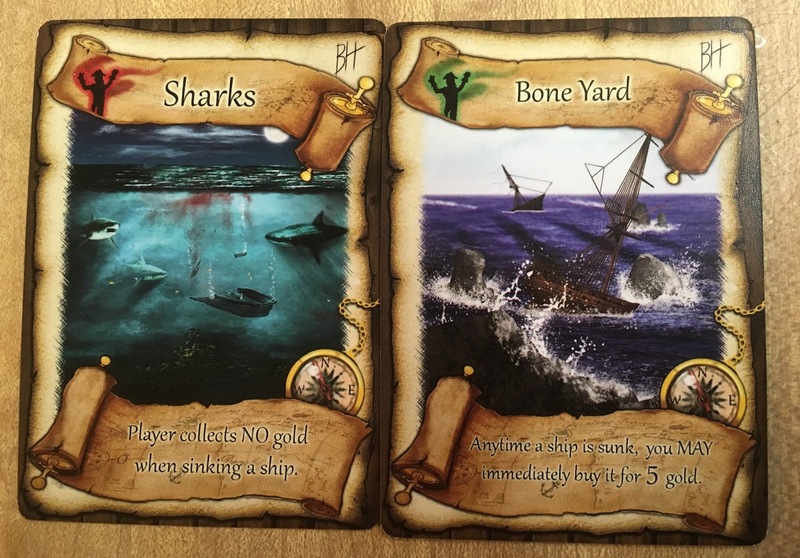 The first expansion pack of 50 cards "Pirate Attack- The Magic Shop" adds a Magic Shop full of things to help your ships and hurt your enemies. 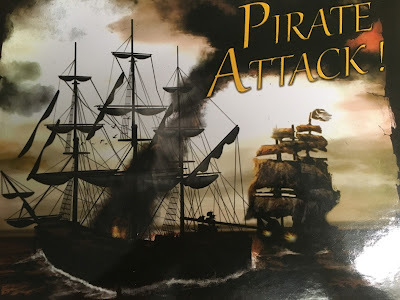 The second expansion pack of 50 cards "Pirate Attack- Raise The Dead" adds more Ships, more main deck cards and more Magic Cards. 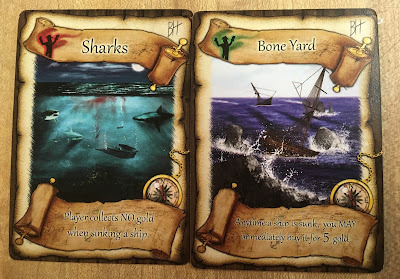 The third expansion pack of 50 cards "Pirate Attack- Miss-Direction" adds more Ships, more Magic Cards, more Sea Creatures and Wind Storms. 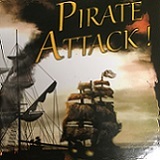 The forth expansion pack of 100 cards and 2 Dice "Pirate Attack- Walk The Plank" adds another Ship, more Magic Cards and many new play cards that create all new things to happen during the game. The fifth expansion pack of 100 cards and 1 Chip "Pirate Attack- The Tavern" adds a whole new market. The Tavern is a place where you can bribe a drunk sailor into telling you secrets and info, some good, some bad. The sixth (and final) expansion pack of 50 cards and 2 dice "Pirate Attack- Special Abilities" gives players (who chose to) a Special Ability, but only if they are willing to Sell Their Soul to get it. Overall, we really enjoyed playing this game and it's very unique. I loved all of these expansions and they're the best part of the game. The Special Abilities really was interesting as you get to have a special ability at the cost of your soul which makes you also take a negative ability in exchange. In my case, it didn't work out well, but my friend loved having the Vault ability that protected his stuff from other players. 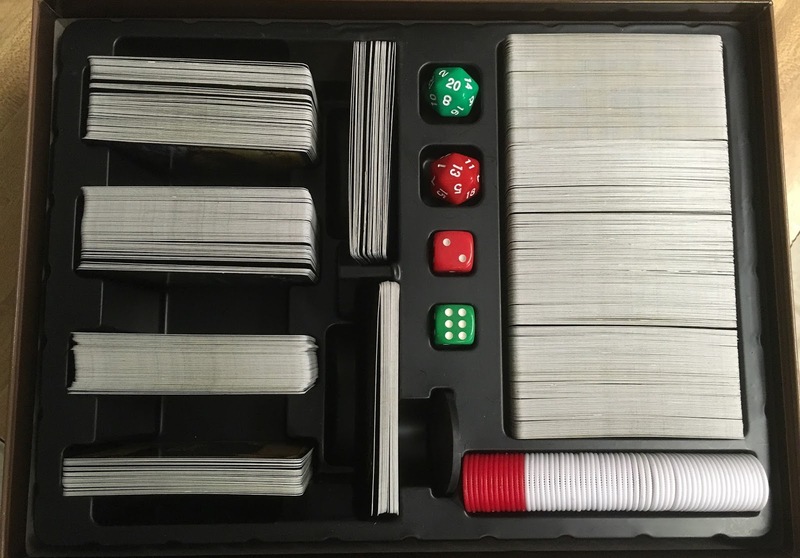 The game itself is well made with a sturdy 9" x 12" x 3" game box that includes a plastic insert to hold all the cards from the main game and each expansion pack (see above picture), so all the cards are kept together. The cards themselves are also sturdy and high quality in color with effective and interesting art. The game can be played with three to ten players for ages eight and up, but I'd recommend playing with as many people as you can as it's a lot more fun with extra players. As every game can be completely different thanks to the cards, it adds a lot of replayability to it that is nice for those of us that get burned out doing the same thing over and over again. I highly recommend this game and you can support his game by helping fund it on Kickstarter here.